Air France, the flag carrier of France, has some very intriguing products from an aviation perspective — and there’s no question that it’s one of the top ways to fly to Europe. They have a huge route network due to the massive tourist appeal that France offers to America, and the market is very strong in this space since these 2 countries aren’t all that far apart. There are quite a few options here, so let’s get started! We’ll talk about La Premiere, the different business class products offered by Air France, and the preferred economy seats to take when you fly with them. Air France’s plane selection is a mess. They operate at least 6 different aircraft on flights to the U.S., and aircraft swaps are common, especially on non-flagship routes (such as between Chicago and Paris). 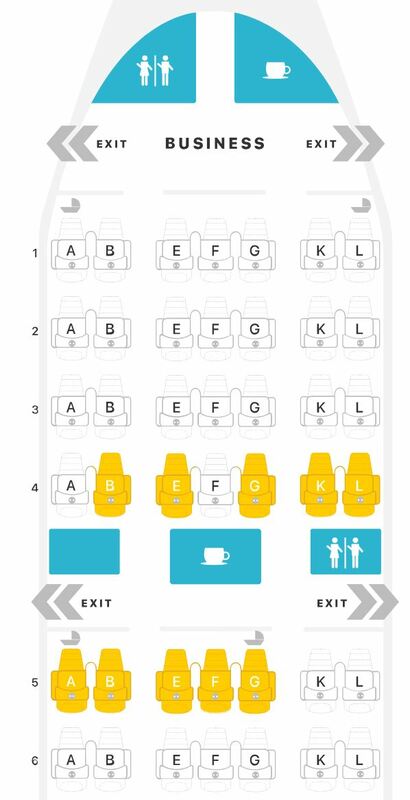 Additionally, these aircraft can have different seat maps, so be on the lookout for this. 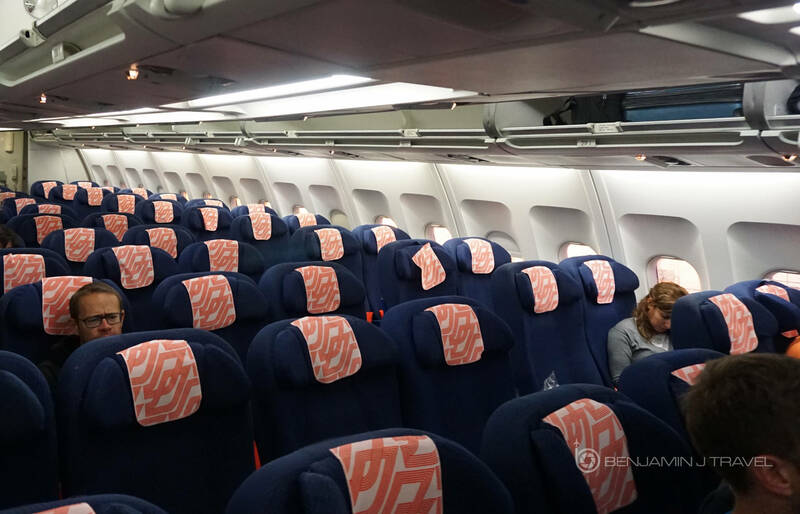 Usually the configuration and seat sizes are the same — but the number of seats offered in a particular cabin could vary a lot. This analysis might get a bit convoluted and confusing just because of the number of aircraft we’re analyzing — but hang in there! This information is extremely useful, and you don’t want to be sorely disappointed if your seat isn’t what you were expecting. As a SkyTeam partner, Air France can be booked with Delta SkyMiles, Korean Air SKYPASS miles, and of course their own mileage system, known as Flying Blue miles. For the most part, you’ll find that the best value is using Air France/KLM Flying Blue miles. If planned properly, you can get business class flights one-way from America to Europe for only 53,000 Flying Blue miles! Additionally, Flying Blue is a transfer partner with all the major transferable currencies: Chase Ultimate Rewards, American Express Membership Rewards, Citi ThankYou Rewards, and Marriott Bonvoy. Using Delta SkyMiles is probably the second-best option since there’s a ton of different ways to earn Delta SkyMiles as well! 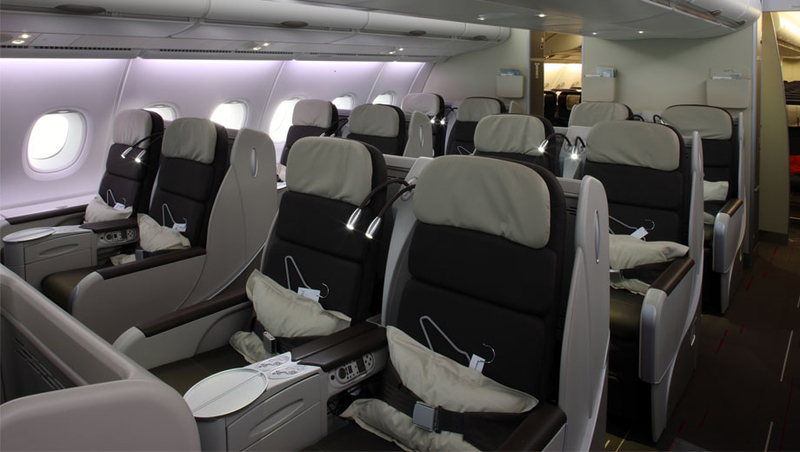 Indulge in French elegance and perfection with Air France La Premiere on the 777-300ER. Image courtesy of businesstraveler.com. La Premiere on Air France is somewhat of a unicorn in the points world — it’s very difficult to book due to their elite status and points requirements. 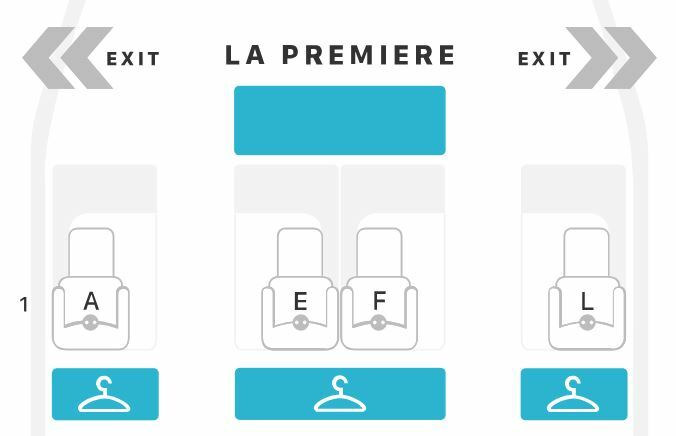 To even book La Premiere, you must be an Air France/KLM Flying Blue elite member. In addition to this requirement, you need to pay 200,000 Air France/KLM Flying Blue miles one-way for flights from the U.S. to France! There are many great ways to redeem Air France/KLM Flying Blue miles — and this isn’t one of them. This price is simply unattainable for most travelers, and the elite status requirement doesn’t make it any easier to book. Hot Tip: Want to earn more Air France/KLM Flying Blue miles? Check out our guide on the best ways to earn lots of Flying Blue miles. As you will find on other travel reviews, the fact that La Premiere on the 777-300ER is absolutely superior to the A380 is not surprising at all. In fact, as you’ll find out, the A380 premium cabin products operated by Air France are dated compared to their newer 777-300ER products. On the A380, La Premiere lacks privacy, is outdated, and is not the best representation of the great things Air France has to offer. But the 777 La Premiere is a single row of 4 seats in a 1-2-1 configuration featuring private curtains, beautiful French design, tons of storage, and more space. On SeatGuru, the 777 La Premiere seat dimensions are actually incorrect, as the seat width says 24″. But in reality, the A380 and 777 La Premiere seats have the same dimensions: 35″ wide, 81″ pitch, and 79″ bed length. Air France A380 La Premiere seat map. Image courtesy of seatguru.com. There are 9 seats in this cabin: 2 rows in a 1-2-1 configuration and 1 lone seat in the front. Air France 777-300ER 4-class La Premiere seat map. Image courtesy of seatguru.com. The 777-300ER La Premiere product is much more exclusive than the A380. There are 4 seats aboard the 777-300ER compared to 9 on the A380, and the 777’s hard product is much more modern and private. If given the choice, you should always opt for the 777-300ER La Premiere on Air France. Bottom Line: Regardless of which hard product you fly, you will experience classic luxury and exceptional service with the soft product on Air France’s La Premiere. But we recommend the 777-300ER if at all possible! 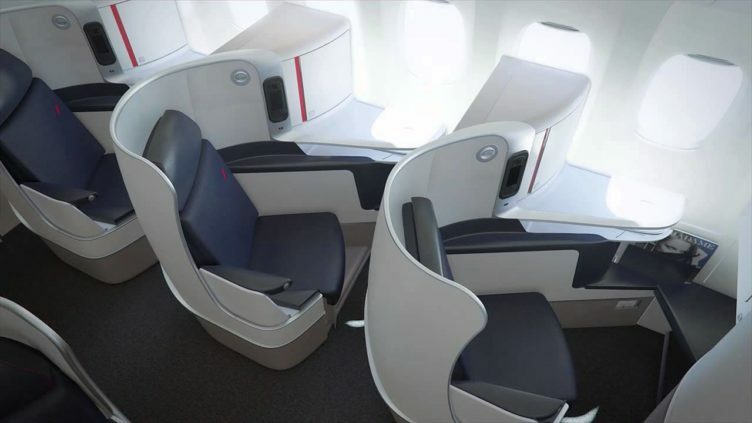 Access Air France’s best seats in business class on most 777s. Image courtesy of airfrance.com. Let’s talk about business class options on Air France, which are plentiful. The bottom line is there are many different business class products — but the best ones are on the 777-300ER and 777-200ER, with the exception of the 777-300ER used on flight AF 681 from Atlanta (ATL) to Paris (CDG). Most of Air France’s business class seats are outdated, so it’s absolutely essential to get the aircraft right here! This can be difficult given their track record with aircraft swaps, but we’ll give it a shot. As you can see above, the only seats with direct aisle access and lie-flat capability are on the 777-200ER and 777-300ER (4-class). By default, these 2 aircraft win the battle for best business class seat options, and it’s not even close. 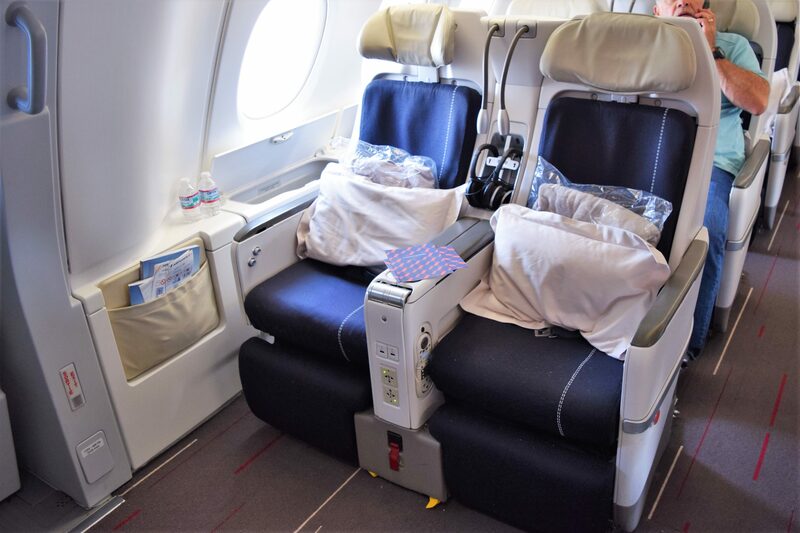 To make matters worse for the other aircraft, the 777-200ER and 777-300ER (4-class) have reverse herringbone business class seats, so there truly is no contest to determine which Air France business class seats are better. Hot Tip: Check out our step-by-step guide on the best ways to fly to Paris with points and miles! We prefer the 777-200ER in business class because there are only 40 seats along 10 rows in a 1-2-1 configuration, as opposed to 58 seats in the 777-300ER 3-class variant. Air France 777-200ER 3-class business class seat map. Image courtesy of seatguru.com. As you can see, there are 2 mini-cabins. When flying on the 777-200ER in Air France business class, the best seats are in row 12: they’re the most private and experience the least foot traffic. Moving over to the 777-300ER 4-class aircraft, your first choice should be seats in row 3, followed by row 20, due to their private nature. Nobody will be walking in your area, as the lavatories and galleys are located in the middle of the business class section. The A380 comes in third, with a lackluster 2-2-2 angled-flat seating configuration. These seats, though lagging severely behind the reverse herringbone seats mentioned above, are still better than the remaining business class products. Though the A380 is a beautiful plane and an aviation masterpiece, for some reason Air France chooses to maintain an angled-flat product on these superjumbos. Air France A380 business class. Image courtesy of ausbt.com.au. However, that’s about it for the benefits of this seat. The 2-2-2 angled-flat configuration lacks true privacy and is outdated. Nevertheless, sitting in business class is a lot better than sitting in economy. Air France A380 business class seat map. Image courtesy of seatguru.com. If you find yourself on the A380 in business class, it will behoove you to nab the bulkhead seats in rows 60 or 65, as you get some more legroom. Unfortunately, the bulkhead seats are located near the lavatory/galley — if that’s something you can’t overlook, pick seats in row 73 for slightly better privacy (since nobody will be walking near you). Let’s move on to the A340 and A330. The seat configurations are identical for these aircraft: 2-2-2 angled-flat seats with a 21.5″ width, 61″ pitch, and 78″ bed length. In this case, the A340 edges ahead of the A330 due to a more private cabin size of 30 seats (instead of 40). Air France A340 business class seat map. Image courtesy of seatguru.com. Since the lavatories and galleys are at the back of the business class cabin, you would want to sit as far forward possible, with row 1 being the best-case scenario. Air France A330-200 business class seat map. Image courtesy of seatguru.com. The A330 has the same seating arrangement, but with an extra mini-cabin behind the lavatories and galley. However, you do not want to be in row 7, because the bassinet seats directly behind this row may cause some noise during the flight. Stick with row 1 if possible on the A330 business class. Finally, the last aircraft to fly Air France business class on is one that I honestly didn’t know existed before writing this piece: the 777-300ER 3-class. Unfortunately, these seats are going to be the least preferable of all Air France products to/from the U.S.
Air France 777-300ER 3-class seat. Image courtesy of youwentwhere.com. The 3-class 777-300ER has business class seats in a 2-3-2 configuration, and all seats are angled flat. Air France 777-300ER 3-class business class seat map. Image courtesy of seatguru.com. If you’re flying on the Air France 777-300 3-class business class product, sit in rows 1 or 2, because they’re going to be the quietest. Another option is row 6, but there may be some noise due to the proximity to the bassinet seats in row 5. Bottom Line: There are lots of discrepancies across different planes, and you absolutely need to know which routes fly which aircraft — it will significantly affect your experience and enjoyment on your business class flight. Air France A380 premium economy. Image courtesy of airlinereporter.com. We’ve said that the A380 lacks any sort of competitive edge when it comes to business and first class, but the A380 is actually the best case for flying premium economy! Right off the bat, we notice that the seating configuration on the A380 is 2-3-2, which is a pleasant surprise for how huge the A380 is. This means that these seats afford you more space! On top of this, the A380 is a phenomenal plane to fly on due to the sheer size and the lack of noise in the cabin (seriously, you’ll forget you’re flying on a plane). Air France A380 premium economy seat map. Image courtesy of seatguru.com. 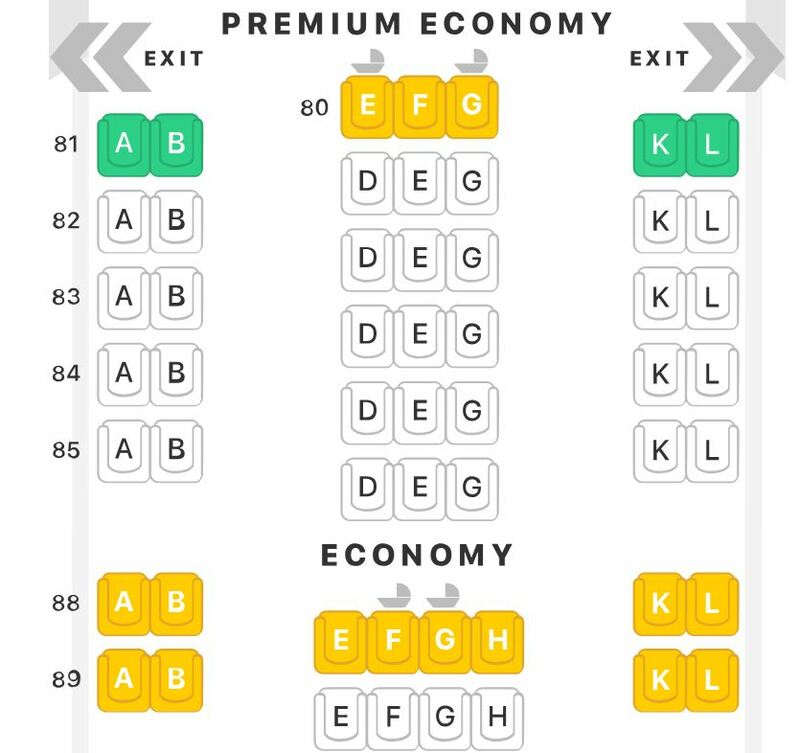 The best premium economy seats on the A380 are 81A/B and 81K/L, so try to grab those first! Second place in Air France premium economy is tied between the A340 and A330. These are completely identical (even in number of seats), so the driving factor would definitely be the airport you’re flying out of. Air France A330-200 premium economy seat map. Image courtesy of seatguru.com. 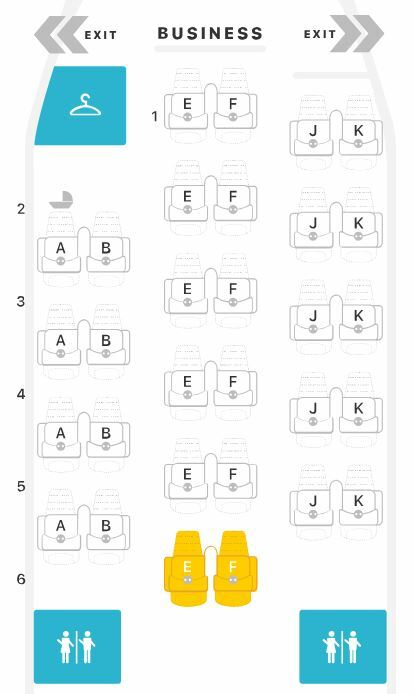 The best seats are at the bassinet/bulkhead, so pick row 19 on the A330 and row 14 on the A340. It’s also difficult to predict far in advance if the A340 will be flown due to aircraft swaps at the last minute. Now, we’ll get to seats with the denser configuration: 2-4-2. Premium economy seats on the 777-200ER and 3-class 777-300ER are identical: 21 seats in a 2-4-2 configuration. Air France 777-300ER 3-class premium economy seat map. Image courtesy of seatguru.com. The most spacious seats are again in the bassinet/bulkhead, so pick row 14 on the 3-class 777-300ER and row 19 on the 777-200ER. Finally, the least preferable premium economy product in our opinion is on the 4-class 777-300ER. Oddly, this aircraft has the best first and business class products — but the least ideal premium economy seats. They’re arranged in a 2-4-2 configuration, but the reason why they’re not ideal is because they’re so close to the lavatories. Air France 777-300ER 4-class premium economy seat map. Image courtesy of seatguru.com. The best premium economy seats on the 4-class 777-300ER would be in row 26, as it is the furthest away from the lavatories. 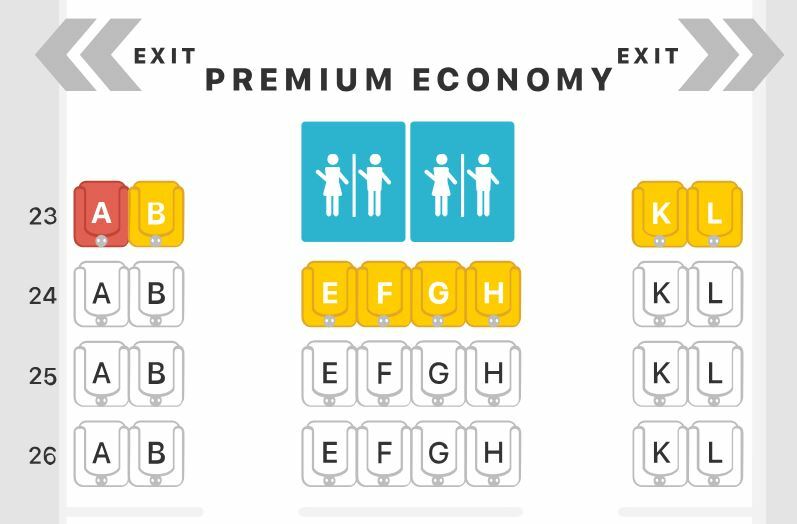 Overall, there’s a lot less variability in premium economy products from Air France. All the seats are the same width and pitch, and the few differences that do exist lie in the seating configuration and density. Bottom Line: If you can, fly on the A380 in premium economy in seats 81A/B and 81K/L. Air France economy on the A340. Image courtesy of benjaminjtravels.com. Now that we’ve covered the premium economy seats, let’s cover our last section: coach. The clear winners here are the A330 and A340 — they have the widest seats, measuring at 18 inches! Between them, the A330 edges out over the A340 due to having fewer seats; the configurations and seat dimensions are the same. Air France A330-200 economy seat map. Image courtesy of seatguru.com. Notice that 24D and 24G have extra legroom on the A330 — if I found myself flying economy on this aircraft, I’d pick them first. 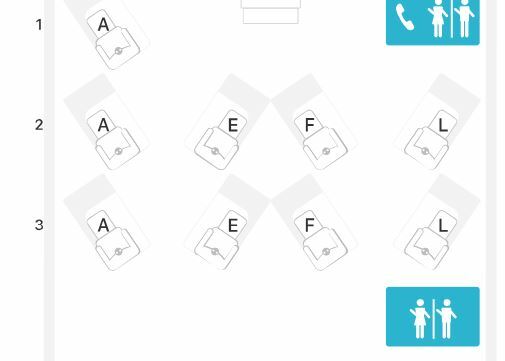 The A340 has the same arrangement, and the same preferential seats are located at 19D and 19G. This plan is flown rarely only on the Chicago (ORD) – Paris (CDG) route. Air France A380 economy seat map 1. Image courtesy of seatguru.com. As you can see in seat map 1, some of the best seats are 10C/K, 11A/L, 30B/C, 30J/K, and 34D. All of these seats will allow you to have more legroom, so be sure to have them on your radar when choosing seats on the A380. The A380 also has another economy cabin that’s much smaller and more private. Air France A380 economy seat map 2. Image courtesy of seatguru.com. Consider 90E/F/G/H and 91B/K at the top of your list too! 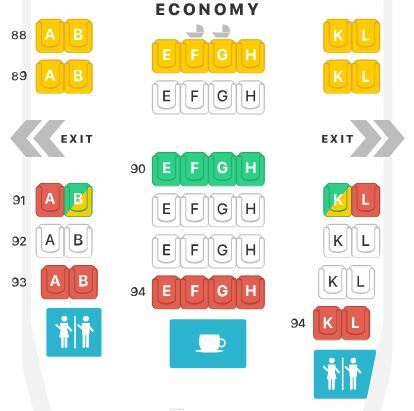 Couples may also like row 92A/B and 92K/L due to its 2-seat row configuration. Bottom Line: The A380 economy class seats are a half-inch narrower and therefore less ideal than the seats on the A340 and A330, but there are still opportunities for seat optimization. On the 777-200ER, there are several good seats out of the 216 total in economy: row 23, 24C/J, and side rows 45-47 (which have 2 seats on each side). Air France 777-200ER economy seat map. Image courtesy of seatguru.com. On the 777-300ER 3-class aircraft, your best economy class seats are 26 B/C, 26J/K, 43 E/F/G/H, and side-row seats in rows 50-53 (A/B and K/L seats). It might be wise for couples to reserve seats in rows 50-53, as it is only 2 seats on each side. For those who need legroom most, choose seats 26B/C or 26J/K. Air France 777-300ER 3-class economy seat map. Image courtesy of seatguru.com. 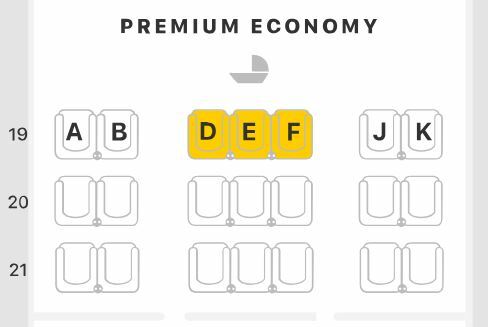 The very last aircraft we’ll be discussing in economy is our bottom choice for 1 reason: the fewest preferential seats available (meaning lowest chance of reserving the best seats). This is on the 777-300ER 4-class aircraft. 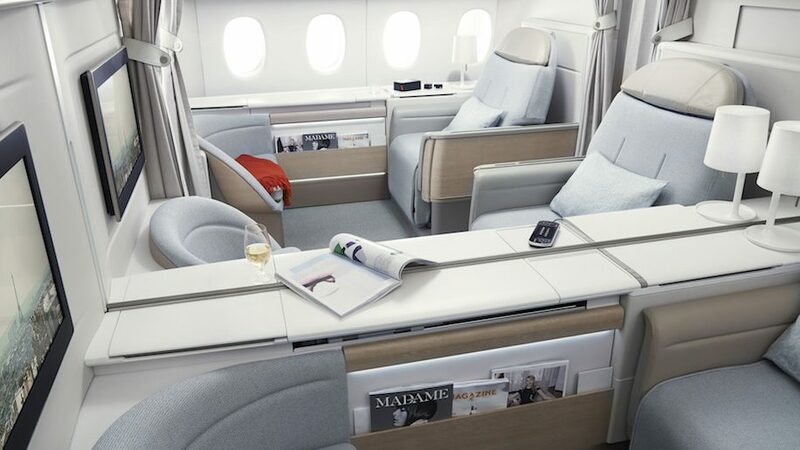 Although there are some fantastic business and first class products on the Air France 4-class 777-300ER, their premium economy and economy seats are the least desirable of all. 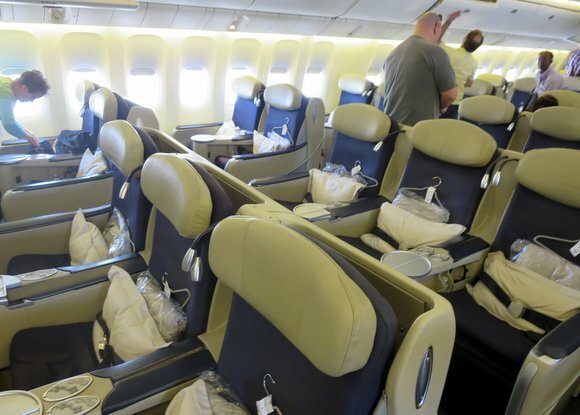 Still, a seat is a seat…so let’s briefly talk about the best ones on the 4-class 777-300ER. Air France 777-300ER 4-class economy seat map. Image courtesy of seatguru.com. The best seats are 29C/J, side-seats in rows 49-50, and seats 39B/C and 39J/K. 29C and 29J offer extra legroom due to a missing seat, so that’ll be excellent to stretch out your legs. Row 28 is not a preferential seat — although it’s in the bulkhead, a wall in front of your legs will restrict your legroom. Side seats in rows 49-50 are ideal for couples traveling together since you’ll have a row to yourself. Lastly, seats 39B/C and 39J/K are good because they’ve got tons of exit row space to stretch out. The main disadvantages are that the seat width is reduced due to the inflight monitor being stored in the armrest, and the proximity to the galleys and lavatories making for a noisy background. Bottom Line: Overall, the 18″ wide seats on the A330 and A340 win in economy class on Air France. The A380 has lots of seats that can significantly enhance your comfort due to extra legroom and location, but they’re slightly narrower at 17.5″ wide. Fly La Premiere on the 777-300ER. Do not settle for the A380 if you can help it. In business class, choose the 777-200ER or most 777-300ER’s (with the exception of AF 681 from Atlanta to Paris). These reverse herringbone seats are the best and most private! Take premium economy on the A380! The spacious 2-3-2 configuration is unusual on the superjumbo, so you should take advantage of it. For economy, fly on the A340 and A330. These seats are wider than the others and are less dense, making for an improved coach experience. We’ve gone over all the Air France routes to/from the U.S., and it’s quite complicated. Keep in mind that frequent, last-minute aircraft swaps can make or break your trip, so be on the lookout for those! Overall, though, Air France’s predictability is decent, especially on flagship routes — so 90% of the time you’ll be alright! What's the best way to book Air France La Premiere? So, the only way to book is when you’re a Flying Blue elite member and use 200,000 miles. Otherwise, you would be better off searching for cheaper cash flights, but it’s still very expensive (thousands of dollars). What's the best ways to book Air France business class? Generally, the best ways to fly Air France in business class are by using Delta SkyMiles or Air France/KLM Flying Blue miles. With Delta, it’ll cost 75,000 miles each-way and you’ll also get award access even before Air France! With Air France/KLM’s variable pricing system, it will cost anywhere from 53,000-70,000 miles each-way. However, if you land a promo award, you can bring that cost down 25%-50%! What are the best ways to book Air France premium economy class? Currently, one of the only ways to book Air France premium economy is with Air France/KLM Flying Blue miles. Using their award calculator will help you calculate the exact cost of lowest-level awards. Generally, mileage costs range from 45,500-57,500 miles each way. What's the best way to book Air France economy class? Delta is a great option for economy awards. Fuel surcharges aren’t passed on, which will save you a lot of money. Awards on Air France metal cost 32,500 miles each way. Air France is another option, but they pass on fuel surcharges, which can be counter-productive if your goal is to pay as little money as possible on your flights. For LAX to CDG, I think you omitted 0069, which is a 777 with the new configuration in La Premiere (4 seat cabin, etc.). Same thing for 0072 coming back. Thanks for reading. We’ve updated this article accordingly. We appreciate the feedback! I’m flying from Houston to Paris on July 6. The website indicates this aircraft is the 777-300ER. I will likely fly economy unless I upgrade. SeatGuru indicates there are 4 versions of this aircraft. Do you know which version it is? Hi Scott, please be advised **we are not Air France** – we are Upgraded Points, a website publishing articles on points and miles as well as other travel related pieces. As such, we cannot confirm which version of your plane you are flying, especially since we do not know the flight number. You can try searching a site like Flight Stats to see if you can find any additional information, but again without your flight number we are unable to even get that far. If you cannot find the information there, the best option would be to call Air France’s customer service!